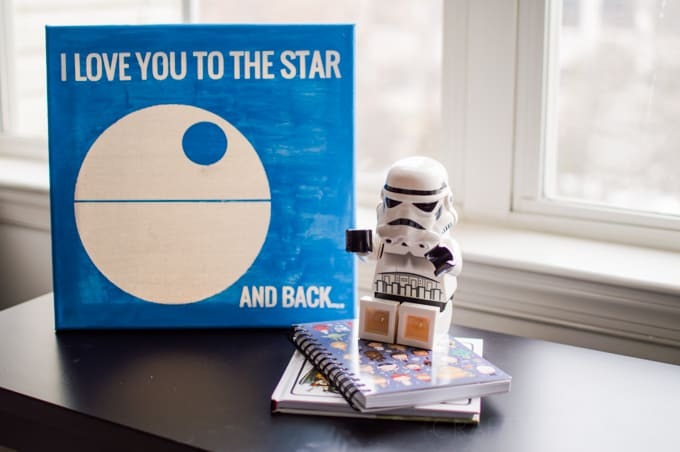 Give a Star Wars fan a little love from the Empire this Valentine’s Day with this nerdy canvas. 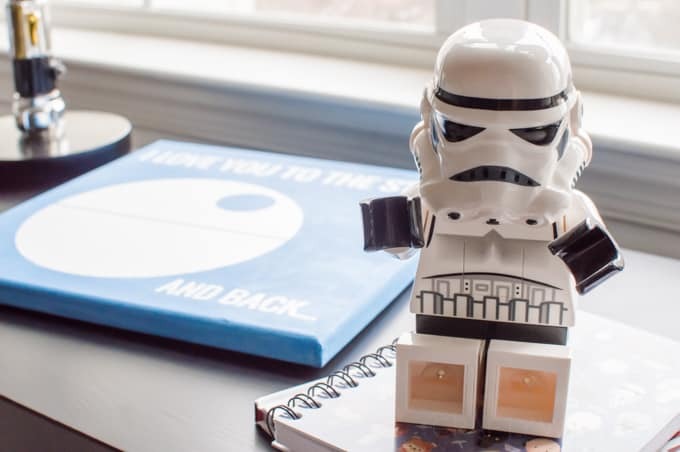 You want to know who is hard to buy for? Chris. He is impossible. Mostly because he’ll just buy something the moment he thinks he’d like to have it, and that means I have about two seconds to jump on it and buy it for him so I can boast about how great a gift giver I am. Yea, who am I kidding. That doesn’t happen. Instead, he buys himself this awesome gift and I am stuck with candy or a funny card. I have to be the lamest gift giver ever. Well, not this year. This year I’m ahead of the game. This year I got him something he won’t find in a store. Because it’s handmade. And it’s Star Wars. And it’s awesome. Ever since The Force Awakens came out Chris has been on a Star Wars kick. He started watching The Clone Wars on Netflix and he maybe, kind-of-sort-of got me interested in it too. And he’s also been online a lot looking up theories on certain characters and trying to figure out why Kylo Wren is so stinkin’ emo. Okay, maybe that last part is more me than him. That kid has so much angst he could rival Taylor Swift’s latest boy-hater songs. 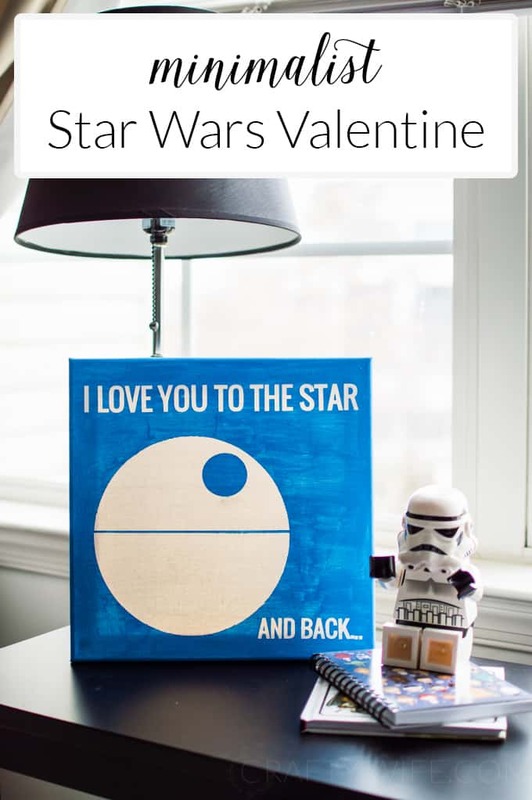 When I was trying to figure out what to do for Valentine’s Day, I figured it had to be Star Wars themed. 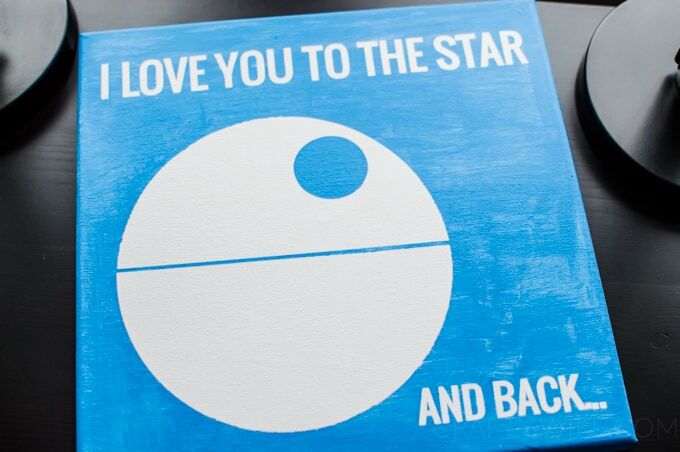 But I didn’t want to do the cutesy “I Love You” “I Know” Han & Leia canvases I’ve seen everyone do. Because, I have to be different y’all. And also, Chris is more of an Empire guy. He’s one with the dark side of the force. So, his present needed to reflect that. For this canvas I wanted to try something called the PVPP method. It stands for Paint Vinyl Paint Peel. And let me tell you, I kind of love it! 1. Paint your base color on the canvas and set it aside until it’s dry. While the paint is still wet go ahead and cut out your Silhouette file. Set your design aside for now, you’ll weed it in a second! 2. Once the base color on your canvas dries paint over it with a layer of mod podge. Set it aside again while it dries. 4. 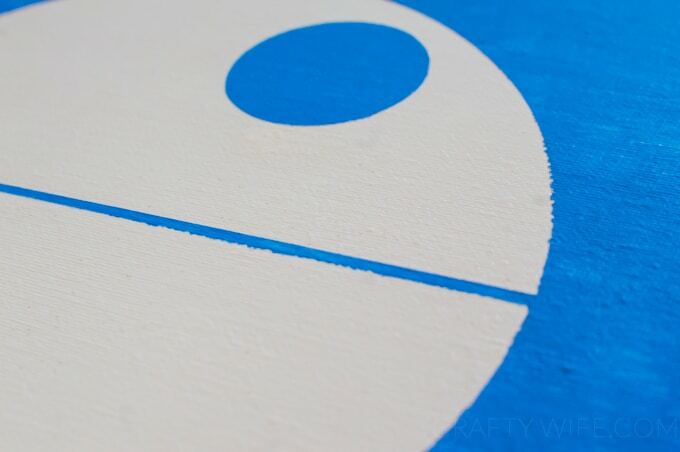 Paint another layer of mod podge over your vinyl design and let it dry. 5. Then, using your top coat color, paint over your vinyl design again. Make sure to cover the entire canvas. As the paint dries go ahead and start peeling up your vinyl using your hook tool. Once that’s done give yourself a pat on the back. You’ve successfully done the PVPP method! I had a few imperfections on my canvas where the top coat bled through the vinyl stencil. They were easily fixed by painting over them! Also, my lines aren’t as crisp as I’d like them to be. But since this was my first time doing this I think it came out really well. And I can’t complain! To be honest, there aren’t a whole lot of things that can top someone building a computer for you. Yea, Chris built me a computer one year. You know what I did for him? I got him a shirt. And some candy. And the best wife award goes to…..someone who is not me. But this year….oh this year is different. Instead of a shirt, I got him a canvas. A beautiful, blue colored canvas. SCORE. So tell me, what’s the best present you’ve either given or received? Haha! A beautiful blue canvas! I love how this turned out, what a fun gift idea! I’d have to think about the best present I’ve ever given or received. That’s a tough one haha! Thank you!!! We’ll have to see if he’s as excited about his gift as I am. I think that his new computer may overshadow anything else. 🙂 And I agree! I have a hard time pinpointing what the best gift I’ve ever gotten is. I’m not hard to please though, so that’s probably why….